We decided to stay in Vancouver, British Columbia a night before and a night after our Alaskan cruise. Traveling from Austin, Texas to Vancouver and rushing to get on a boat in the same day didn’t sound like much fun. Neither did doing the opposite on the home. And a delay in a flight out could mean missing the boat. As it happens, the airlines know which days are departures and arrivals for the cruises, so the flights were much cheaper on the other day. So much so, that it more than paid for the two nights in a hotel. We stayed at the Sutton Place Hotel, which was just a few blocks from the Port of Vancouver. It was just far enough away that we didn’t feel guilty taking a taxi. Vancouver was a beautiful city. Perhaps the greenest central business district I’ve ever seen, with mountains visible in most directions. 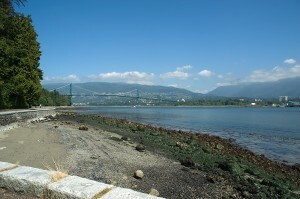 The jewel of the city is Stanley Park, a 1,000 acre forested preserve at the north west tip of downtown. 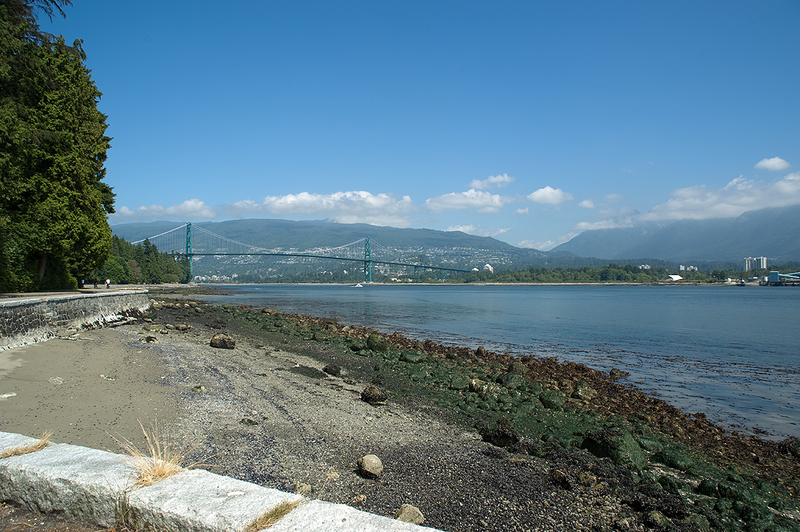 It’s surrounded by a paved seawall, making for a beautiful stroll. There is also Vancouver Aquarium. Aubrey usually loves aquariums, but didn’t seem to be too into this one. It’s possible that this is due to spending too much time on a plane earlier in the day. 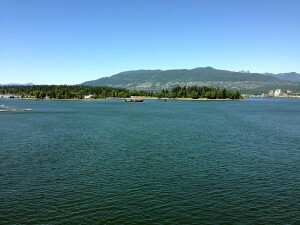 We actually ended going to Stanley Park both before and after the cruise. It’s that nice. The morning after the cruise, we took Aubrey down to the splash zone in Stanley Park. It’s fairly large, and wasn’t too crowded that morning. Aubrey loved it. Later in the day, we visited Granville Island. This is a neighborhood located beneath the Granville Street Bridge on the south side of False Creek. It is a collection of artisans, markets, boutique shops and restaurants, with a cool and hip, yet friendly vibe. The Wife ended up falling in love with, and purchasing, a silk wrap with wool roses. We also, of course, bought a few t-shirts. We had a snack of donuts fried in duck fat at the stand outside Edible Canada in Granville. It was every bit as weird as it sounds, but was also a wonderful combination of sweet and savory. I usually don’t like these mixed, but I’d eat there again. Then we strolled through the Granville Island Public Market. It was five or six buildings worth of stalls for local vendors of produce, meats, cheeses and more. The selection of fruits alone was amazing. If I lived in Vancouver, I could easily by my groceries here two or three times a week. We had dinner at The Sandbar, a seafood restaurant on Granville Island. It was fairly good, but overpriced as you would expect in a touristy area like this. I’m not sure when we’ll return to Vancouver, but I’m certainly looking forward to it.